I’m an experienced and accomplished technical all-rounder equally at ease with digital strategy, consultancy, technical architecture, digital project management and web development (these days an Ember evangelist). Over twenty five years, I’ve steered and developed many pioneering and celebrated creative digital projects. From heading departments early in my career to being a business owner for two decades, I take pride in delivering to the highest creative scrutiny and latest technical standards. I’m lauded for providing a key bridge between creatives, developers and main project stakeholders - eliciting the respect of all with knowledge, empathy, patience, tenacity, clarity and, not least, a light touch and a little humour. This interactive platform charts American migration through objects which tell the very personal stories of the migrants. Commissioned by the Tenement Museum in New York and developed by 201 Created, I contributed development and project management to this Ember application. The official website for Philippe Starck. Designed by GBH, the concept had a simple premise which required a bold technical solution. The site displays the entire Starck universe of over 1,500 products, projects, news and media items on a single page which the user can then filter. Originally built using Ember, the project marks a challenging new approach to the way marketing sites are conceived and developed. A simple, slick, easy to use room booking tool for this stylish group of boutique hotels belies the technical complexities of this 18 month project. Marrying the ambitions of Mama Shelter, the design of GBH and the technical requirements of AccorHotels required many skills and many hats. I acted as Technical Architect, Technical Director, Project Manager and Front End Developer on this Ember build. Over the last 25 years, I’ve worked with an eclectic array of creatives across a multitude of digital platforms covering hundreds of projects. Although disparate, whether it’s work for corporations like Warner Bros. and Channel 4 or creative mavericks like Mike Figgis and Philippe Starck, what typifies these projects is an ambitious and innovative idea that has required an unprecedented technical solution. Whilst the solutions are bespoke and cutting edge, my task is always to make sure it is the idea and not the technology that becomes the story. Quizzes on the web can be typified as either looking terrible or being style over substance affairs with poor content. The challenge set by Channel 4’s in house agency 4Creative was to break the mould and offer an online quiz that would satisfy the keenest of pub quiz aficionados with a front end experience that would match the production values of the companion More4 on-air trails. The result was fusing stills photography with live action and a real-time multiplayer game engine. It also cast me in the unlikely role of double for David Starkey, who was comped in later. The magic of green screen. Laughter is infectious. How funny would it be if we could see that? That was the premise of this campaign devised by the good people at The Viral Factory. I was tasked with sorting out how it worked. Whilst people watched a clip of other people laughing, their webcam captured them laughing. Our magical player, which could be embedded into any site, then automatically added them to the original clip. Over 8,000 people were recorded and it was watched over 9 million times. The best bits are online here. It was awarded a D&AD Silver Pencil. I was able to utilise my academic background in artificial intelligence in a campaign website for a psychological horror film. At the heart of this site promoting the Warner Bros production Trauma, starring Colin Firth, is a computer model of Rogerian therapy which acts both as site navigator and, mimicking scenes from the film, an unseen personal therapist. 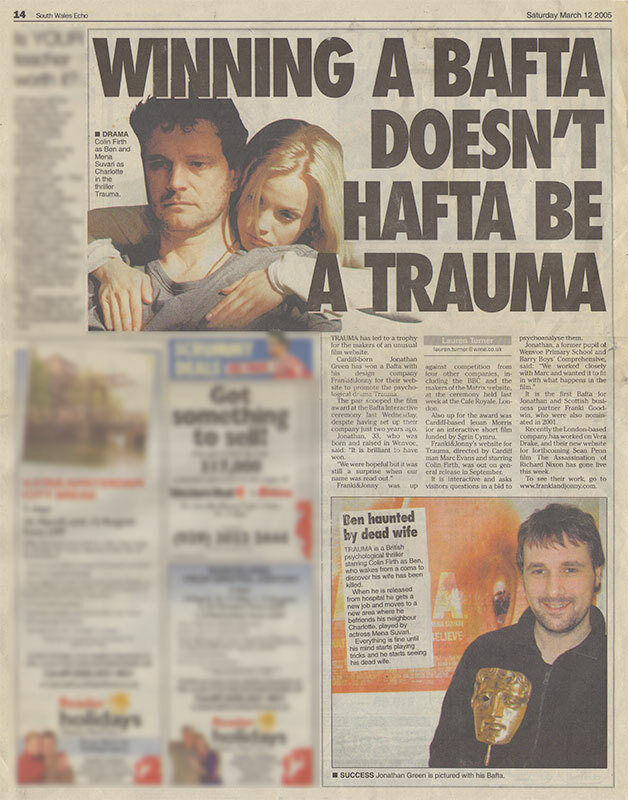 It won a BAFTA for best film website, which in turn, perhaps more significantly, garnered me column inches in the South Wales Echo (who honoured it with one of the punniest headlines you’ll find west of Fleet Street). When Mike Figgis asked me to piggy back the production of his A-list ensemble movie shooting in Venice and create an online experience, I didn’t need too much convincing. Backed financially by Film4, I ran a guerilla team, including award-winning director Damien O’Donnell (East is East) and my soon-to-be collaborator in Franki&Jonny, Franki Goodwin. For six weeks, we lived, ate, slept and worked under the same roof as the cast in the same hotel as the eponymously titled film was set. The 96 pieces of content we created included short films starring Salma Hayek, David Schwimmer and Rhys Ifans amongst others as well as graphical, photographic and animated content inspired by the location, the story and Mike’s maverick filmmaking techniques. The project was years ahead of its time with the Film industry only now starting to recognise the value of companion content. It didn’t go unnoticed though, gaining much critical acclaim including a BAFTA Interactive nomination. You can read my blog post on the project for more information. Most of my time as the inaugural Head of Technology at SAS (now part of MSL Group) was spent in the world of digital communications for blue chip corporates such as BT, British Gas and HSBC. As a brief diversion, I was able to put my experience of touch screen development (long before tablets and smart phones made this commonplace) into practice in this fun, very personal project for The Science Museum. The kiosk displayed a famous face, constructed using the same E-FIT software used by the police. Users had to commit this to memory, then had 30 seconds to recreate it. Working with the very talented designer Mr Ben Tomlinson, we transformed the concept of the original E-FIT software into something a child could use. We also had great fun recreating our own faces, which of course we left on display whenever visiting the museum. Picture the scene. It’s the mid nineties. Hair is spiky and suits are baggy and, whilst working as Head of Technology for a post production company, I spent many long nights and weekends locked in a small room with a Silicon Graphics workstation and many crisps building a system for this quiz show for S4C, the Welsh language broadcaster. The result was a real-time 3D game based on noughts and crosses operated by the contestants via tracker balls, with a guiding hand from me in the gallery. Sadly, the only remnants the interweb could provide of this classic of the 3D-noughts-and-crosses-TV-quiz-show genre is this dodgy on many levels VHS recording. Thanks though to whoever saw it fit to preserve.